FRENCH ENGINEER AND INVENTOR JACQUES DE VAUCANSON’S THREE AUTOMATED FIGURES—THE FLUTE-PLAYER, THE DRUMMER AND THE DUCK—OF THE LATE 1730S SEEMED TO BE AS MUCH ABOUT REVEALING THE INNER WORKINGS OF LIVING CREATURES AS BEING A FORM OF ENTERTAINMENT AND SPECTACLE. THROUGH THE DUCK’S OPEN ABDOMEN ONE COULD OBSERVE THE HUNDREDS OF MOVING PARTS AS THE LIFE-SIZED REPLICA ATE AND APPEARED TO DIGEST FOOD. IN VAUCANSON’S DUCK, ERNIE ALTHOFF, ROBBIE AVENAIM AND DALE GORFINKEL APPEAR TO HAVE PRODUCED A SIMILAR ARRAY OF MOVING PARTS, HOUSED WITHIN THE THREE ROOMS (AND FOYER) OF BUS GALLERY, WHILST ALSO REVEALING, VIA A TWO-WEEK SERIES OF CONCERTS WITH SPECIAL GUESTS, THEIR OWN INTERNAL WORKINGS AND PROCESSES AS ARTISTS. The installation component of Vaucanson’s Duck features a collection of constructed and deconstructed sound-making objects. Each is accompanied by fictitious museum-style labeling attributing all of the works to Jacques Vaucanson, with titles such as Self-portrait with Duck, Duck Egg Blues, Two Left Webbed Feet and Duck Photographed by Edweard Muybridge. Althoff’s constructions are the first to be encountered in the foyer and the long room adjoining it. Most feature either a record player or tape player as the driving mechanism for an object that strikes various other constructions placed in its path. One in particular has three polystyrene cups held in place on three turntables by split bamboo structures. 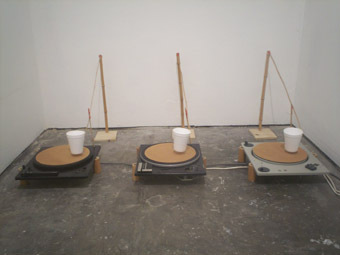 Pointed legs attached to the bases of the cups inscribe marks onto masonite discs on the record players producing a drone of rough, scraping sounds; this in contrast to the mainly percussive textures that Althoff’s other instruments produce. Gorfinkel also employs the polystyrene cup in his deconstruction of the vibraphone. 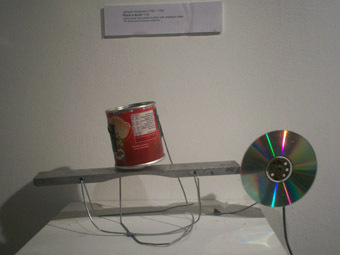 Along with other vessels—tin cans, tennis ball canisters, plastic cups—he resonates vibraphone bars by placing motorised discs (predominantly CDs and Meccano wheels) against them. Suspended from the ceiling, or propped up on makeshift wire stands, the previously percussive instrument becomes a rich drone-making device while the vessels, swaying over the bars, shift the timbre as the sound is trapped within their small empty spaces and vibrate sympathetically. Avenaim turns the percussive into drone by resonating the skin of a suspended kick drum with a vibrating spring attached to its lower surface. Another instrument features a suspended motorised drumstick, set off kilter by a fifty cent piece which jitters over an array of objects resting on another drum. Metal discs, rocks, bells, a spanner, wood, bamboo and a tambourine are some of the objects that the rapidly paced drumstick encounters. A motorised kick drum pedal with variable speed, a super 8mm projector with a circular saw blade instead of a film reel, and various resonating motors and objects also form some of Avenaim’s explorations into instrument making. The performances included a selection of the instruments from the installation, additional elements and guests performing with the trio on most nights. The second night comprised a duet between Althoff and Avenaim concluding with a solo by Gorfinkel. Althoff played a pair of children's coloured spinning bells, a wind-up frog and some of his percussive instruments while Avenaim played his haptic, jittering motorised drumstick, drone kick drum and some small motors on varying surfaces. The percussive sounds bounced about the space tingling the ears. A vibraphone with a series of Meccano wheels grinding away at the ends of vibraphone bars seemed to cue Gorfinkel to begin his solo, activating the bar instruments throughout the space and creating a dense, shimmering drone of medium to high pitched tones. He then distributed other bars, each with a fishing line handle and a mallet, to the audience who added their own percussive elements to the tones. The final night’s performance featured a duet between Althoff and Philip Samartzis with Avenaim and Gorfinkel joining in. Althoff’s fan instrument swayed, striking a series of pewter bowls and other metal objects, while another fan knocked large sake bottles containing varying amounts of liquid. Samartzis responded with creeping fluttering tones which hovered and then moved into the foreground, transforming the space and setting Althoff’s live instruments in a new sound environment. Althoff came back with a wood and metal whirring instrument spun from an adjustable fishing line until Samartzis retreated, giving us the 'actual' acoustic space again. We saw more of the interior of the duck when there appeared to be a break in the communication flow as the concert’s end was announced while Avenaim and Gorfinkel were just getting started. The result was cymbals crashing into and scraping along the walls, drones from aluminium bars, fast thudding kick drum and scattering percussion creating a rock‘n’roll ending to a previously subdued yet engaging sound art performance. RealTime issue #82 Dec-Jan 2007 pg.